Over the past few years it’s been my pleasure to read the very interesting blog at David McElroy. 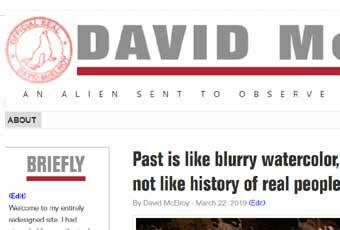 When I first started reading David’s articles he wrote largely about political issues, and that is in fact what drew me to his website to begin with. Over the years, David has expanded his writing to the point that it now includes very few political articles, but rather a wide assortment of musings about life in general. David has the keen ability to understand human nature – and to see both the best and the worst in all of us. It’s rare that I read an article that David has written that does not cause me to gain some further insight into both my past – and perhaps – my future. A couple weeks ago it came to my attention that David had installed a new WordPress theme at his website. I complimented him @DavidMcElroy via Twitter to let him know that I liked his new website. This led to a discussion about what David saw as the failings of his new theme, including some features and design elements that he’d like to see on his new website. I have a fair amount of experience with developing WordPress websites and I have always enjoyed David’s writings, so I offered my services to help David develop his new theme so that it included most of the things he wanted. The end result can now be seen at DavidMcElroy.org. As has been the case for at least seven years, I developed David’s new theme using the Genesis Framework from StudioPress. I started with a pre-packaged theme, but made significant adjustments to both the theme styling and code so that the site worked the way David envisioned. I am pleased with the overall product and so is David.